Are you a historian or archeologist? Whether you are an archeologist or just a traveler, you will love to visit the Munyara near Munnar. This scenic destination fascinates travelers with its megalithic relics. Muniyara is place in Munnar near Marayoor. In addition to extensive sandalwood plantations, a lot of people visit Marayoor in order to watch these stone attractions. Muniyaras are the burial chambers that made up of 5 stone slabs. A large stone called cap stone covers the chamber. Visiting the Muniyaras in Munnar can be a wonderful experience for each traveler. People love to visit this place because it will give an insight about the ancient age. You can imagine about the mystic history of Stone Age people and their culture by visiting this place. The main attraction of the place is its stone burial chambers called the Dolmenoid cists. There are several such chambers and each one of them built using 5 stone slabs. It is also amazing to see the ancient rock paintings at this place. Historians believe that these stone slabs are more than 1000 years old. In fact, it is a favorite place for many of them because they keep special interest in those burial chambers. Many archeologists and anthropologists from across the globe visit Muniyara to watch and study the remnants of the stone burial chambers belonging to the Megalithic age. Most of these burials contain several chambers and they might use to bury more than one person at one place. Just pay a visit to this tourist attraction if you love to take a look into the history of Megalithic age. Muniyara locates in Marayoor in a scenic area of Idukki district. 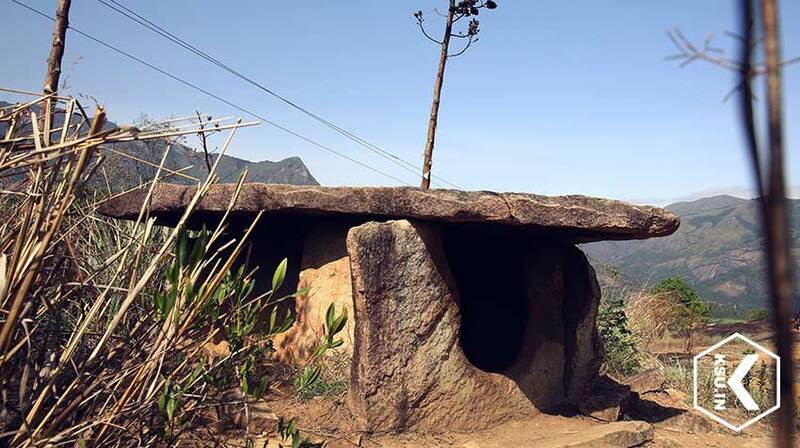 One needs to travel around 40 kilometers from Munnar to reach this amazing prehistoric dolmens. Aluva railway station is almost 151 kilometers away while Ernakulam railway station is nearly 168 kilometers from this tourist place. Cochin International Airport is around 150 kilometers away from these aboveground burial chambers. Located on the beautiful slopes of Western Ghats, visiting Muniyara can be a majestic experience for each visitor. Besides historians and anthropologists, a lot of travelers love to visit Muniyara in order to watch its burial chambers. In fact, it is a must-visit place for holidaymakers and honeymoon couples to Munnar. The nearest tourist attraction Marayoor attracts travelers with its large sandalwood forests. So, log on our website www.ksu.in to plan a trekking to the mystic Muniyara.